The list of the top 500 supercomputers is published every 6-months by top500.org. The update released on June 2010 is available here. Jaguar ranks first. Jaguar climbs to first place displacing Roadrunner which now occupies third place behind China's Nebulae. China's Nebulae is second. China joins the first 10-systems in the list; Nebulae ranks second in the benchmark tests and it is first in peak performance clocked at 2.98 peta-flops/s, e.g. 2.98 x 10^15 floating-point instructions per second. Linux on commodity hardware. Linux maintains first place as the dominant operating system a reversal of roles with Unix that dominated the field back in 2000; today, 91% of the top-500 supercomputers run on Linux as shown in the graphic below. The hardware is based on commodity Intel and AMD processors, all use x86-64 64-bit technology not much different than that found on conventional new desktops and laptops. 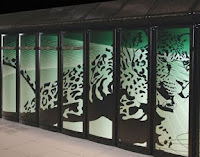 Today, 91% of the top-500 supercomputers run on thousands of interconnected conventional servers, pizza-box like computing units, each containing four or more Intel or AMD cores/processors; Jaguar uses 6-core AMD Opterons. A distribution among system integrators, listed as vendors in the top500.org list, is included here. The site lists 32-vendors; the graphic below shows vendors with the most entries in the published list. The data values released on June 2010 for hardware, Operating System (OS) and distribution of the top-500 supercomputers across countries are shown below. These stats are derived from the detailed information found at top500.org. Note that the category shown as 'Intel and AMD' is the sum of the systems listed under Intel IA-64, Intel EM64T and AMD x86-64; 455 = 5 + 401 + 49 respectively.